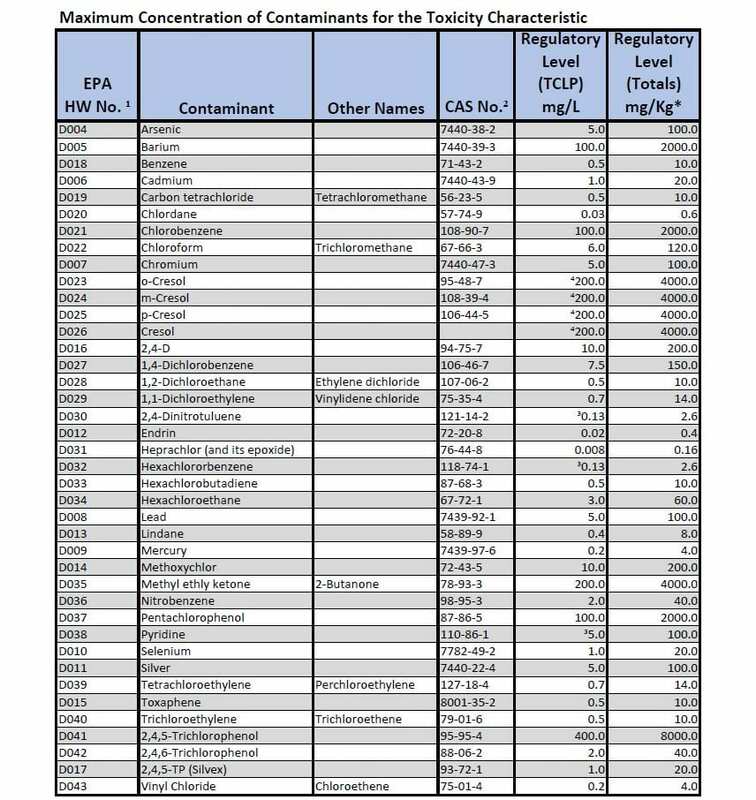 TESTING AND SAMPLING WILL CONFORM TO EPA “Test Method for Evaluating Solid Waste” SW-846 for benzene, toluene, ethylbenzene, and xylenes (BTEX) by United States Environmental Protection Agency (US EPA) Method 8260 and RCRA 8 metals (arsenic, barium, cadmium, chromium, lead, mercury, selenium, and silver) by US EPA Methods 6020A and 7471. The number of samples per waste source will be specified by a consultant as per SW- 846 or will consist of at least four discrete samples and no less than one sample per 100 cyd of material to be disposed of. Sample and test for total levels of contamination of specified material — produce “mg/kg” results. Higher than initial screening limits requires TCLP analysis test results. TCLP testing is required on potentially hazardous waste. ALL OF THE FOLLOWING MUST BE COMPLETED AND APPROVED BEFORE MATERIAL WILL BE ACCEPTED. ​Copies of all analytical data directly from the lab. ALS IS THE PREFERRED LAB. Financial assurance from the appropriate municipality at $49.50 per ton of material. A properly completed MCSWMA Waste Characterization / Demo Form. A copy of the consultants error and omission insurance policy with Marquette County Solid Waste Management Authority listed as the certificate holder. The policy must have a minimum coverage of $1,000,000. Schedule of delivery is by appointment only. Proper notice by 2:00 p.m. on the day preceding delivery is required. Hauler needs to bring in the original completed MCSWMA Waste Manifest with the material. (A minimum of one is needed for each truck for each day of hauling. If more than six loads are brought in by a single truck, another form must be completed. All loads must be covered with a tarp.